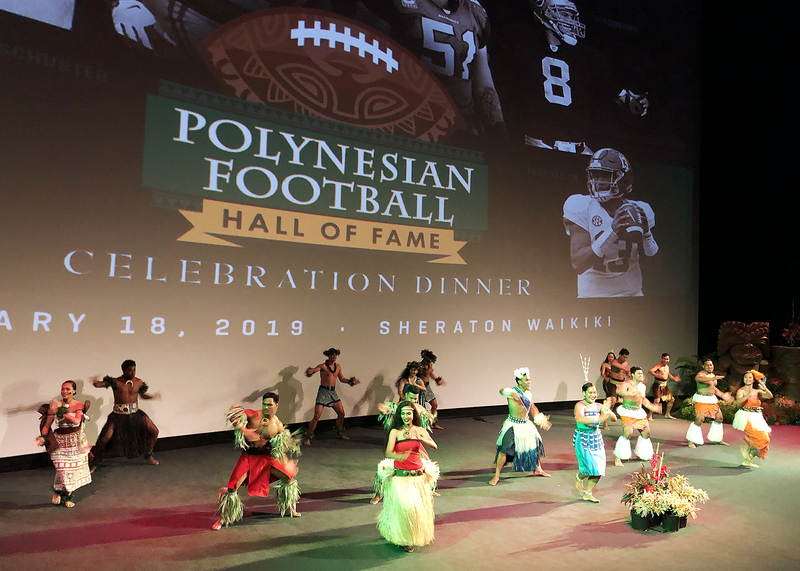 The Polynesian Football Hall of Fame (PFHOF) enshrined the Class of 2019 in their permanent display at the Polynesian Cultural Center (PCC) on January 19, 2019 and recognized several other honorees. PCC president and CEO Alfred Grace welcomed all the honorees to the Center and pointed out our partnership with the PFHOF has been a natural fit since the inaugural Class of 2014. “Congratulations to all of you,” he said. 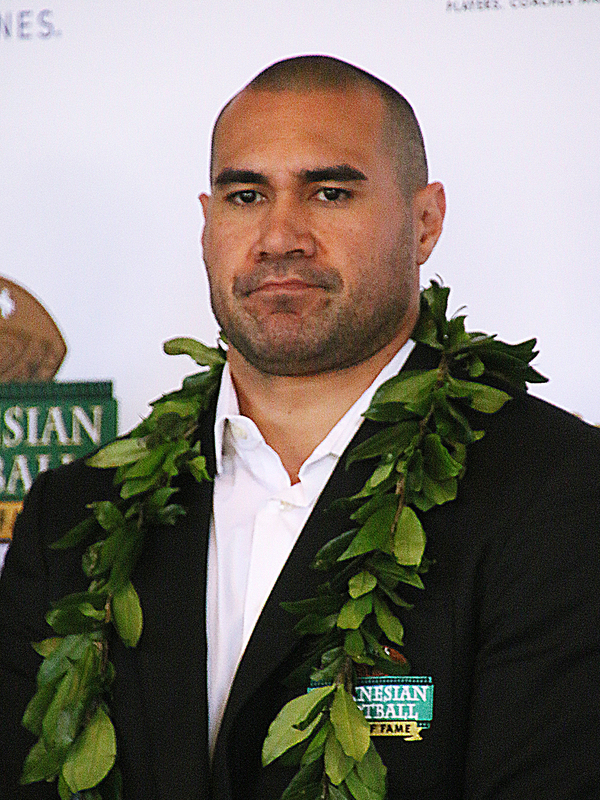 “In acknowledging you, I acknowledge all of our Polynesian people who excel in every worthy endeavor they take on. 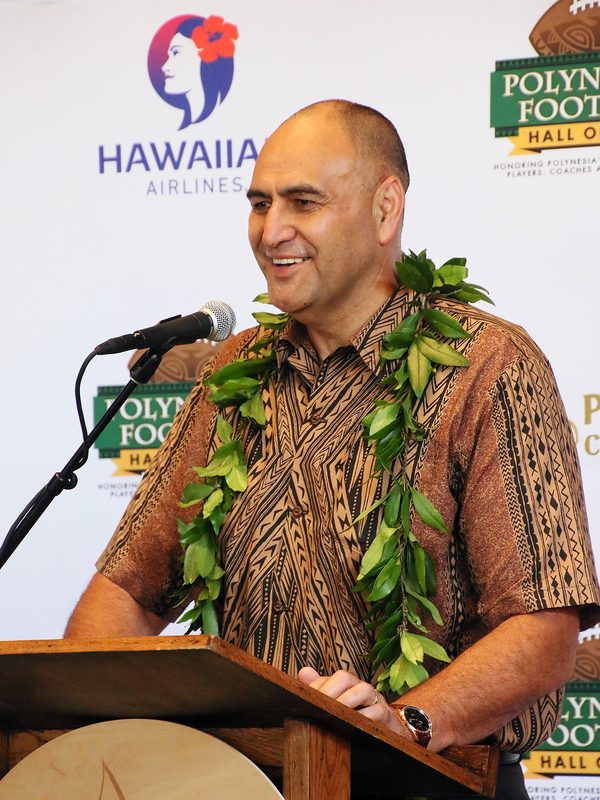 President and CEO, Alfred Grace, welcomes inductees at the Polynesian Football Hall of Fame. 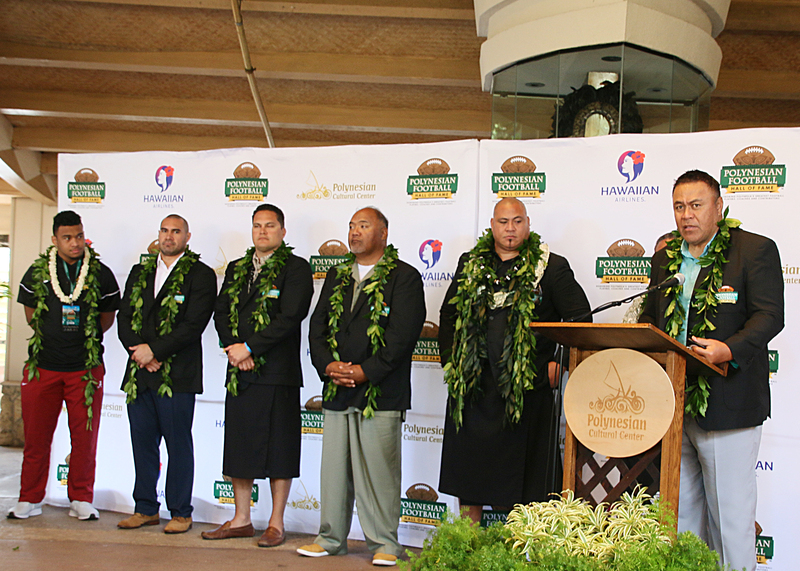 During the special program that day in the PCC’s Hawaiian Journey Theater, the PFHOF presented the Class of 2019 athletes with a customized jacket and Hall of Fame ring, featured their achievements on the gridiron, and gave them the opportunity to speak about what and who motivated them to reach the pinnacles in their sport. Vai Sikahema addresses attendants of inductee ceremony. 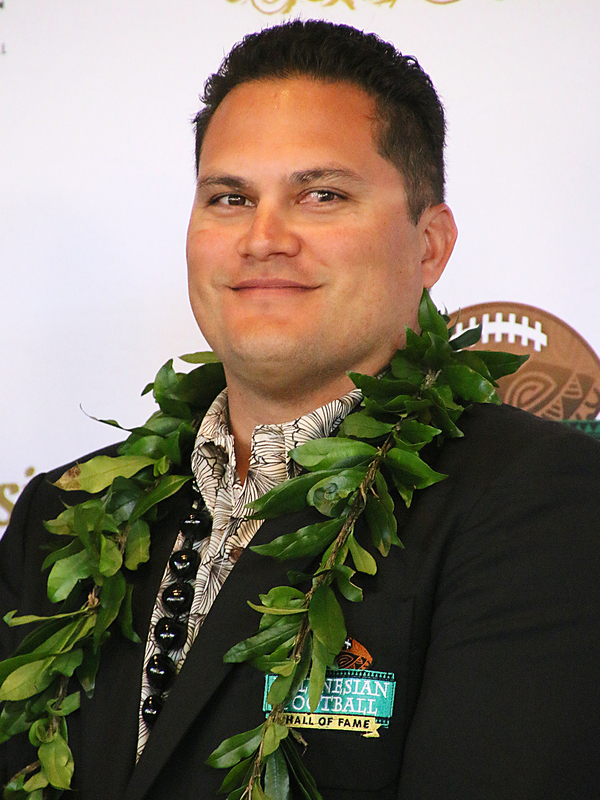 ♦ Dan Saleaumua (Samoan) grew up in San Diego, CA, played for Arizona State, and spent a 12-year NFL DL career mostly with the Kansas City Chiefs. His 18 fumble recoveries is still a Chiefs’ record. Since then he’s been an entrepreneur and involved with local charitable causes. 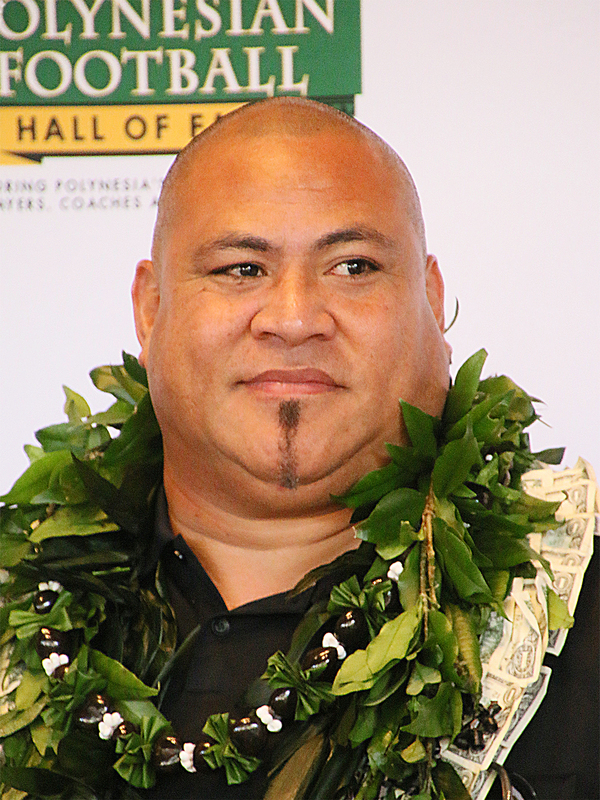 Saleaumua, who has lots of personality, first thanked the PFHOF for selecting him, then his family and friends. “Everything I’ve done up to this date, I’ve always had somebody from my family and friends with me. This journey I’ve been on was not by myself,” he said. ♦ Joe Salave’a (Samoan), from Leone, American Samoa, then Oceanside, CA, then University of Arizona DL, and he played in 100 games during his eight years in the pros. His work since with the Joe Salave’a Foundation once got him invited to the White House. ♦ Lofa Tatupu (Samoan; his father, Mosi Tatupu, is also a PFHOF inductee), grew up in Maine, where he played quarterback with his father as coach, went on to play defense for USC, then for the Seattle Seahawks. Though his NFL career was cut short by injuries, he left an impressive record of achievements. ♦ Marques Tuiasosopo (Samoan), the first Division I quarterback (University of Washington) to pass for at least 300 yards and rush for another 200 yards in the same game. He was the 2001 Rose Bowl MVP and went on to play for eight years in the NFL, seven of them with the Oakland Raiders. ♦ 2018 Polynesian College Football Player of the Year:University of Alabama quarterback Tua Tagovailoa, a Samoan from Ewa Beach, Oahu. ♦ 2018 Polynesian pro football player of the year: JuJu Smith Schuster (Samoan), Pittsburg Steelers. 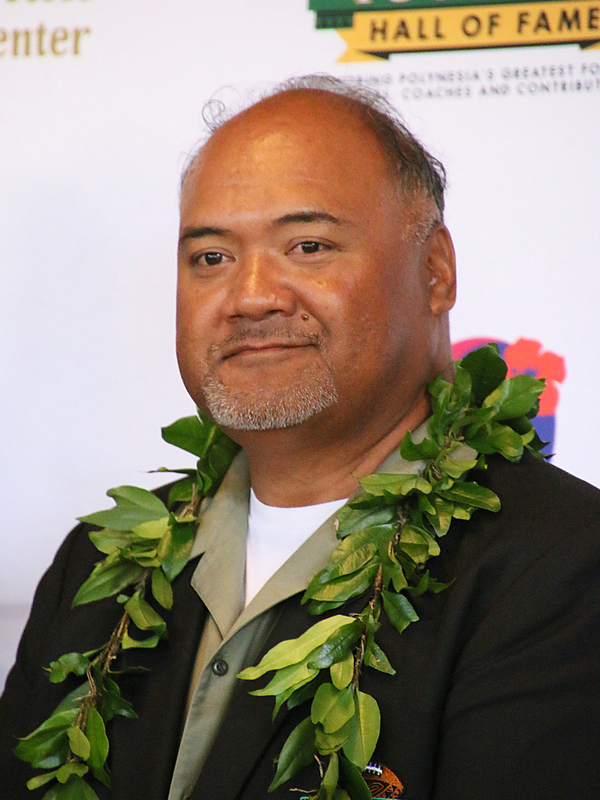 ♦ Past inductees and board members: Jesse Sapolu and Ray Schoenke (2015), Ma’a Tanuvasa (2017), Manu Tuiasosopo (2018); and Reno Mahe, PFHOF board member. ♦ 2019 Founders Award honorees“who really help us fulfill our mission of the Polynesian Football Hall of Fame to acknowledge, honor and preserve the history of contributions Polynesians have made in the great American game of football”: Debbie Weil-Manuma and Corbett Kalama. 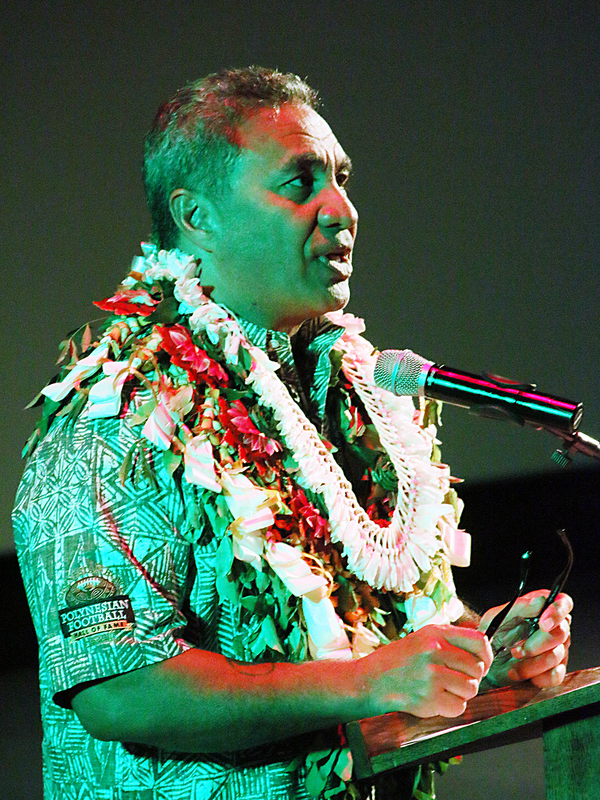 ♦ And he noted that the 2018 Polynesian high school honors went to Taulia Tagovailoa, Tua Tagovailoa’s younger brother who now plays quarterback for Thompson High School in Alabama; and Puka Nacua, Orem High School (Utah) wide receiver. 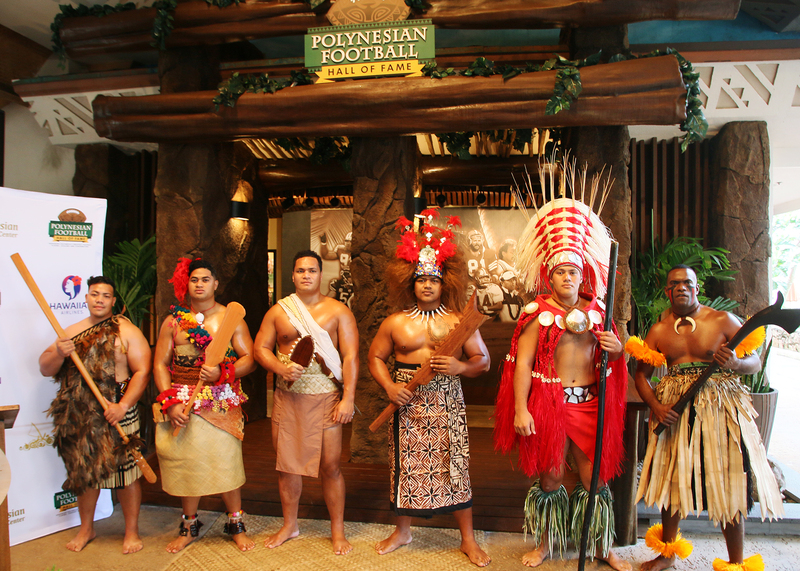 Honor guard stands for inductee ceremony at the Polynesian Football Hall of Fame. The first Polynesian to play in the National Football League: Al Lolotai of Laie, 1945, the Washington Redskins. The first Polynesian to be inducted into the College Football Hall of Fame, Herman Wedemeyer, 1979. The first Polynesian to be inducted into the Pro Football Hall of Fame: Junior Seau, 2015. The first Polynesian to win a Heisman Trophy: Marcus Mariota, 2015. The first Polynesian to be named MVP of a national college football championship team: Tua Tagovailoa, 2018. Story by Mike Foley, who has been a full-time freelance writer and digital media specialist since 2002. Prior to then, he had a long career in marketing communications, PR, journalism and university education. The Polynesian Cultural Center has used his photos for promotional purposes since the early 1970s. Foley learned to speak fluent Samoan as a Latter-day Saint missionary before moving to Laie in 1967, and he still does. He has traveled extensively over the years throughout Polynesia, other Pacific islands and Asia. Though nearly retired now, Foley continues to contribute to PCC and other media.